Clare football manager Colm Collins (file pic). 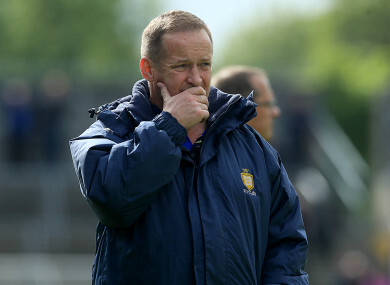 CLARE FOOTBALL MANAGER Colm Collins has hit out at the three-month suspension handed out to defender Gordon Kelly for allegedly squirting a water bottle at an official. And Collins also confirmed that Jamie Malone remains unavailable for the Banner’s re-fixed clash with Roscommon next week after an appeal of his two-match ban was rejected. Both players were suspended for incidents during the recent draw with Tipperary at Cusack Park, while Collins himself is also serving a month’s suspension for comments he made to a linesman during the lively Division 2 football clash. Kelly will be out of action until the championship after he picked up a retrospective ban for allegedly hitting an umpire with water, which he denies doing. “There was a ridiculous decision at the end of the match when Gordon Kelly was cleaning water out of a water bottle and one of the umpires alleged that he hit him with the water. Gordon got three months for that, which is absolute insanity,” said Collins. “All he did was clean out the water bottle before he drank it, like every player in the country does. The umpire says he hit him, which Gordon denies, and he got three months for it. “By all means protect the officials, but let there be something to protect them from if you are going to suspend a player for that long. “Even if he deliberately squirted water at an official – which he adamantly claims he didn’t – three months is a bit much. Malone was sent off in the second-half of the same game following an incident with Tipp selector Shane Stapleton. Stapleton fell and hit his head during the clash on the sideline, which resulted in Malone’s red card, but after sitting out last week’s win over Down in Newry, efforts to reduce the ban have failed. According to Collins, Malone’s ban should have been chalked out, but he looks forward to welcoming the Corofin man back. “We appealed it and got nowhere. Then Congress immediately passed it to make it only a one-game ban. That didn’t apply to Jamie obviously, so he has a two-game ban. “This wasn’t a deliberate thing. The Tipperary selector threw the ball behind him, Jamie pushed him out of the way to get the ball and when he fell, which was an accident, he apologised immediately. Email “'Absolute insanity' - Collins lashes out at three-month suspension of Clare footballer”. Feedback on “'Absolute insanity' - Collins lashes out at three-month suspension of Clare footballer”.